In the 16 months or so since I finished my year of reading the world, I’ve been delighted to hear how the project continues to generate interest and have unexpected consequences. From booklovers discovering stories they would never have otherwise found to other readers being inspired to take on similar quests, it’s great to know that my little adventure has encouraged people around the planet to engage with books in new ways. So you can imagine my delight when, a little while ago, I received a message from film producer Genevieve Lemal. Having worked on such notable movies as Coco Before Chanel and a forthcoming adaptation of Madame Bovary, as well as numerous French-language films, Lemal is always looking for stories that might work well on the big screen. She’d heard about Tété-Michel Kpomassie’s An African in Greenland when she read an article about my project in The Atlantic a few months ago, and decided to take a closer look at the book. Just as I did, she fell in love with the writer’s account of his teenage escape from the clutches of a python cult in rural Togo and amazing journey up through Africa and Europe to live with the Inuit in Greenland. Lemal liked the story so much, in fact, that she thought it would make a good film and was in talks with Kpomassie’s French publisher to secure the rights. If all went well, she hoped to be able to invite me to the premiere a few years hence. A month or so later she was back in touch: she’d been to Paris and met Kpomassie, who is now in his seventies and lives just outside the city. He was an astonishing character, she said, full of stories about his adventures – he even recounted an extraordinary conversation he’d had with his grandfather when he returned to Togo, in which he struggled to explain all that he had seen and done because his mother tongue, Mina, has no word for ‘snow’. I was very jealous as, as I mentioned in my post on his book, Kpomassie is the writer I would most like to meet in the world, so Lemal generously said that if I was coming to Paris I should let her know and perhaps we could all meet up. A few messages further on and a deal has been struck and a scriptwriter engaged, and Lemal is looking forward to going scouting for locations in Greenland. As she warns me, it will be a long time before the film is ready for screening. Nevertheless, I can’t help being very excited. It’s brilliant to think that Kpomassie’s wonderful story has a chance to reach even more of the world. I look forward to shaking his hand on the red carpet when that day comes. 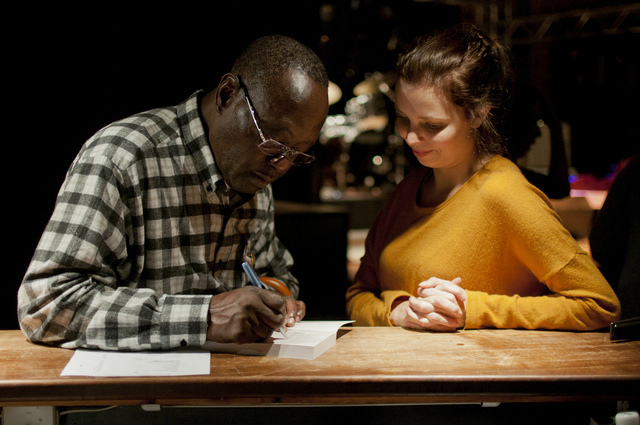 Picture showing Tété-Michel Kpomassie signing a copy of his book at a student event by Stundentersamfunnet Bergen. That is a wonderful story – and just shows how happenstance and serendipity can lead to good things! Looking forward to finding out more about this. What another fabulous story, this journey is neverending! Thanks. Yes. I sometimes have a feeling I’ll be reading the world for the rest of my life (in a good way). Congrat. It’s every writer’s dream. Based on your blog posting,I just finished the book, and I instantly feel in love with him and his sense of adventure. Quite the story, and I am excited for you. The question is, did Kpomassie choose to have Mina use a loan word from French or from Greenlandic (I tried to find a Mina-English or Mina-French dictionary online and had no luck)?